Pressure washers are perfect for nearly any type of cleaning application that you can think of. The 3500 PSI model is suited for all types of siding, such as vinyl, composite, cedar shake, and aluminum, as well as for cleaning concrete patios and wood decks. This machine is great on cleaning pavers, stripping flaking paint or stain from decks, and taking up grease in industrial kitchens. Machines come with quick-connect nozzles that help vary the pressure, a 50' pressure hose with a wand, and can be equipped with a detergent injector that run solution from a bucket through the machine. Optional attachments include the whirl-a-way and long reach wand. The machine weighs approximately 140 lbs. There is a $5 charge for missing nozzles. 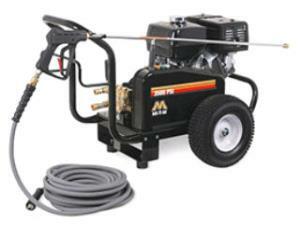 * Please call us for any questions on our pressure washer 3500 psi rentals in Hillsdale and Ridgewood NJ.